Biodiversity: The variety of living beings found in geographical area is called biodiversity of that area. Amazon rainforests is the largest biodiversity hotspot in the world. Need for Classification: Classification is necessary for easier study of living beings. Without proper classification, it would be impossible to study millions of organisms which exist on this earth. Ancient Greek thinker Aristotle classified living beings on the basis of their habitat. He classified them into two groups, i.e. those living in water and those living on land. But his classification was too simple to justify inclusion of a particular organism into a particular group. Organization of nucleus: Nucleus may or may not be organized in an organism. On this basis, organisms can be divided into two groups, viz. prokaryotes and eukaryotes. 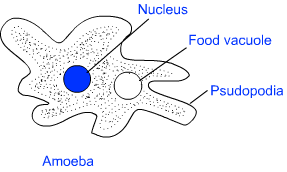 (a)	Prokaryotes: When nucleus is not organized, i.e. 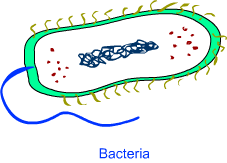 nuclear materials are not membrane bound; the organism is called prokaryote. (b)	Eukaryotes: When nucleus is organized, i.e. nuclear materials are membrane bound; the organism is called eukaryote. Number of cells: An organism can be composed of a single cell or many cells. An organism with a single cell is called unicellular organism. On the other hand, an organism with more than one cell is called multicellular organism. Mode of Nutrition: On this basis, organisms can be divided into two broad groups, i.e. autotrophs and heterotrophs. An autotroph makes its own food, while a heterotroph depends on other organisms for food. Level of Organisation: Even in case of multicellular organisms, there can be different levels of organization. When a cell is responsible for all the life processes, it is called cellular level or organization. When some cells group together to perform specific function, it is called tissue level of organization. When tissues group together to form some organs, it is called organ level of organization. Similarly organ system level of organization is seen in complex organisms. Classification and Evolution: It is a well established fact that all the life forms have evolved from a common ancestor. Scientists have proved that the life begun on the earth in the form of simple life forms. During the course of time, complex organism evolved from them. So, classification is also based on evolution. A simple organism is considered to be primitive while a complex organism is considered to be advanced. 1. Monera: These are prokaryotes; which means nuclear materials are not membrane bound in them. They may or may not have cell wall. They can be autotrophic or heterotrophic. All organisms of this kingdom are unicellular. Examples: bacteria, blue green algae (cyanobacteria) and mycoplasma. 2. Protista: These are eukaryotes and unicellular. 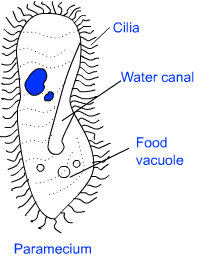 Some organisms use cilia or flagella for locomotion. They can be autotrophic or heterotrophic. Examples: unicellular algae, diatoms and protozoans. 3. Fungi: These are heterotrohic and have cell wall. The cell wall is made of chitin. Most of the fungi are unicellular. Many of them have the capacity to become multicellular at certain stage in life. They feed on decaying organic materials. Such a mode of nutrition is called saprophytic. Some fungi live in symbiotic relationship with other organisms, while some are parasites as well. Examples: yeast, penicillum, aspergillus, mucor, etc. 4. Plantae: These are multicellular and autotrophs. Presence of chlorophyll is a distinct characteristic of plants, because of which they are capable of doing photosynthesis. Cell wall is present. 5. Animalia: These are multicellular and heterotophs. Cell wall is absent.